The Adelaide Morris Men » Blog Archive » We said we’d be appearing in kit, not in K.I.T.T. We said we’d be appearing in kit, not in K.I.T.T. Photo borrowed from The Sun. Hope they dont mind too much. 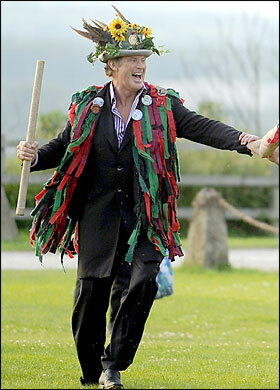 Having singlehandedly brought down the Berlin Wall, and then set London’s West End abuzz with his portrayal of Billy Flynn in “Chicago”, David Hasselhoff it seems is now turning his hand to morris dancing. That great organ of truth and news – The Sun – snapped him getting his tattercoat thang on at Staffordshire’s Tutbury Castle. Presumably we’re going to get in touch with him to see if he’s able to make it to practice on Thursday nights.